Rescue and renew the rough skin on the soles of your feet and prevent further chapping and cracking. 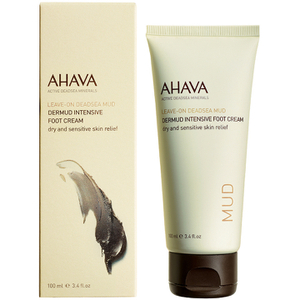 This exclusive formulation – enriched with AHAVA's very own Mineral Skin Osmoter, anti-bacterial Tea-tree oil and other natural plant derivatives –makes the splits and dryness disappear. Enjoy a smoother, revitalized surface on your legs and feet that is visible for all to behold. Massage a generous amount into feet and legs. Aqua (Water), Ethylhexyl Palmitate, Ceteareth-30, Cetearyl Alcohol, Cetyl Alcohol, Glycerin, Sodium Cetearyl Sulfate, Oleyl Erucate, Dehydroacetic Acid, Benzoic Acid, Phenoxyethanol, Hamamelis Virginiana (Witch Hazel) Flower Water, Maris Sal (Dead Sea Water), Aloe Barbadensis Leaf Juice, Dimethicone, Parfum (Fragrance), Persea Gratissima (Avocado) Oil, Simmondsia Chinensis (Jojoba) Seed Oil, Prunus Amygdalus Dulcis (Sweet Almond) Oil, Triticum Vulgare (Wheat) Germ Oil, Allantoin, Salicylic Acid, Tetrasodium EDTA, Menthol, Arginine, Melaleuca Alternifolia (Tea Tree) Leaf Oil, Tocopherol (Vitamin E), Linalool, Citronnellol, Butylphenyl Methylpropional, Amyl Cinnamal, Coumarin, Alpha Isomethyl Lonone, Limonene, Isoeugenol. One of the best foot creams I have ever used. Have used for years. It absorbs quickly and not too heavy. You cannot without it during the winner time. And it is prefectly to keep your foot in good condition!